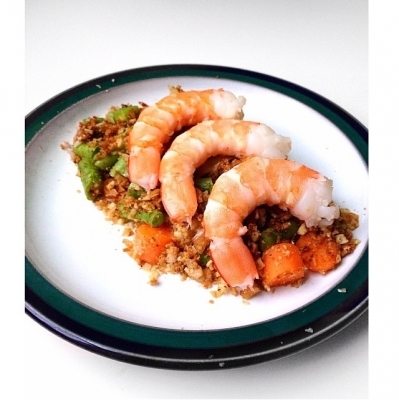 Ripped Recipes - Shrimp "Fried Rice"
Home » Recipes » Dinner » Shrimp "Fried Rice"
Simple low calorie healthy remake of a favourite. Using cauliflower rice instead of rice. Push veg to one side of pan and add quail eggs. Scramble and chop eggs,then mix with veg once cooked. Add shrimp, cook for 1 min. Serve.